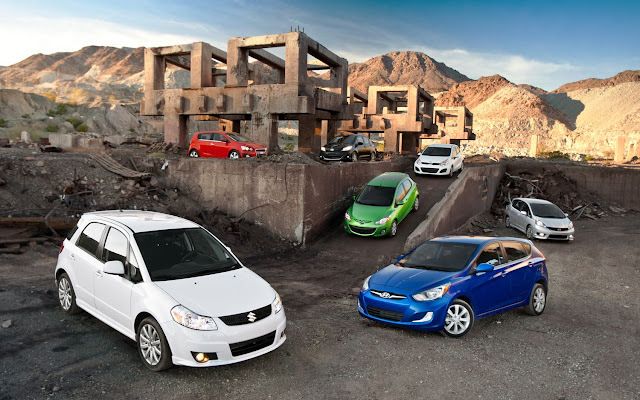 Motor Trend has done a small-car comparison in the April issue (and on its website) of a variety of the five-door subcompacts sold on the U.S. market. I won't give away who won, you'll have to see the comparison yourself. Having driven all of these vehicles except the Accent, I believe the results are pretty much as I would've expected. For whatever reason, MT wasn't able to get that great of mileage out of the Mazda2. I found this remarkable since I was able to extract an impressive 37 MPG out of my 2011 Mazda2 review subject. Huh. And the Honda Fit? Have these two rides just been around too long to be interesting? I did like the Accent 5 door at the auto show. Glad to see it's well regarded. @Sentra SE -- My guess is they didn't include the Versa hatchback because it's an outgoing model to be 100% replaced next year with the updated version. It's interesting that one manufacturer can produce the first- and last-place vehicles in this segment. It's nice to see GM has put their old crap behind them and is able to offer such a solid contender in a segment in which it has historically failed terribly. I'm a big fan of the Sonic. USA Today ran a small-car comparison test too, along with Car & Driver's take it's interesting to compare the comparos. USAT compared automatics and didn't ding the Fit for buzziness at speed, the Rio comes in SECOND (!) having finished dead-last in the MT test and just above the Versa at C&D. What a difference non-enthusiast priorities make!